The Israeli Occupation Force targets Palestinian medics, firefighters, and other emergency workers. The DTR banner encourages solidarity with Palestinian Emergency Workers and anyone may use it. The blog is under construction and welcomes your help, research, and reports. GAZA CITY (Ma’an) — Israeli forces shot and killed a 21-year-old Palestinian woman paramedic on Friday, as she was treating injured protesters during ongoing demonstrations along the Gaza border with Israel, in the southern Gaza Strip. The Gaza Ministry of Health reported that 21-year-old Razan Ashraf al-Najjar, from the Khan Younis-area town of Khuzaa, was shot in the stomach as Israeli forces deployed near the border fence opened fire on a group of five paramedics, including al-Najjar, as they were aiding injured protesters near the fence. Ths spokesperson of the ministry, Ashraf al-Qidra, added that more than 100 protesters were injured on Friday, 40 of them with live ammunition, while the others suffered from tear-gas related injuries. Al-Najjar was one of at least two medics who had been killed by Israeli forces since the “Great March of Return” began in Gaza on March 30th. Since then, 119 Palestinians have been killed, including journalists and children. The weeks-long civilian protest was initially planned to end on May 15, the 70th anniversary of the Nakba, or “catastrophe,” when over 750,000 Palestinians were forcibly expelled from their homes and made refugees with the establishment of the state of Israel in 1948. However, protests have continued since, and are expected to continue into the coming weeks. Tensions have remained high in Gaza, as Israeli forces have launched dozens of airstrikes on the small coastal enclave, killing at least four Palestinians, while armed political groups in Gaza launched dozens of rockets into Israel territory, injuring no one. BETHLEHEM (Ma’an) — The Palestine Red Crescent Society on Sunday declared a state of emergency across the occupied Palestinian territory following an upsurge in violence by Israeli soldiers and settlers, including 14 attacks on the society’s ambulances in just three days.The society said in a statement that it was declaring a level 3 state of emergency and putting all its staff, teams and volunteers on standby.The society decried Israeli violations of international humanitarian law, saying that in a 72-hour period, it had faced 14 attacks against its staff and vehicles “in a serious escalation of violations against PRCS, its teams and the humanitarian services they render.”Most recently, the statement said that Israeli soldiers attacked one of the society’s ambulances while tending to injured Palestinians during clashes in front of al-Quds University’s Abu Dis campus earlier Sunday.Two days earlier, the statement said that Israeli forces attacked an ambulance in al-Issawiya village in occupied East Jerusalem, before they “proceeded to arrest an injured Palestinian from inside the ambulance.”Also on Friday, the windshield of another ambulance was smashed by settlers in Burin village in Nablus, preventing it from “discharging its humanitarian duty.”The society said that on Saturday, five paramedics “were beaten up by soldiers in Jerusalem,” while Israeli forces also attacked an ambulance crew with batons in Jerusalem’s Old City.The statement said Israeli soldiers also “severely beat another ambulance crew in Jabal Al Taweel (Al-Bireh), wounding two paramedics,” afterward detaining a wounded Palestinian from the ambulance.The Palestine Red Crescent Society, which is a full member of the International Movement of the Red Cross and Red Crescent, said that the incidents were “a blatant violation” of international humanitarian law.The society called on the international community, including the UN General Assembly and Security Council, to “shoulder their responsibilities by taking the necessary steps to make Israeli occupation authorities comply” with international law.The Palestine Red Crescent Society was founded in 1968, to cater to Palestinians in the occupied Palestinian territory. Following the 1993 Oslo Accord, the newly established Palestinian Authority Ministry of Health mandated the society to provide an ambulance service to the Palestinian population.Recent days have seen a surge of violence across the occupied Palestinian territory. Tensions had been steadily mounting in recent weeks due to Israeli restrictions on Palestinians seeking to enter the Al-Aqsa Mosque compound in East Jerusalem.A string of deadly attacks on Israelis, including a shooting that left two settlers dead in the West Bank on Thursday, and a stabbing in Jerusalem that claimed two Israelis’ lives on Saturday, prompted further clashes.Dozens of Palestinians have been reported injured in recent days, including many shot with live rounds. According to a Ma’an article, shortly after midnight, a Palestinian paramedic Muhammad Matar al-Abadlah, 32, was killed while he was helping victims in eastern Khan Younis district. GAZA, (PIC)– Israeli occupation forces (IOF) violated the humanitarian ceasefire on Saturday morning and fired at Palestinian citizens and ambulance cars while trying to enter Khuza’a town to the east of Khan Younis. Eyewitnesses said that after the 12-hour ceasefire went into effect at 0800 this morning, Palestinian citizens and ambulance cars tried to enter the beleaguered Khuza’a town but were confronted with Israeli bullets, which forced them and the ambulance cars to leave the area. Citizens questioned the role of the Red Cross that should have coordinated the entry of those ambulance crews to evacuate bodies strewn in the town’s streets and started to decompose. Palestinian medical teams managed to retrieve the bodies of dozens of victims, who were killed by Israeli gunfire in the border areas. Around one thousand Palestinians were killed and around six thousand others were wounded in the Israeli air, land, and sea attacks on the Gaza Strip that started 20 days ago. 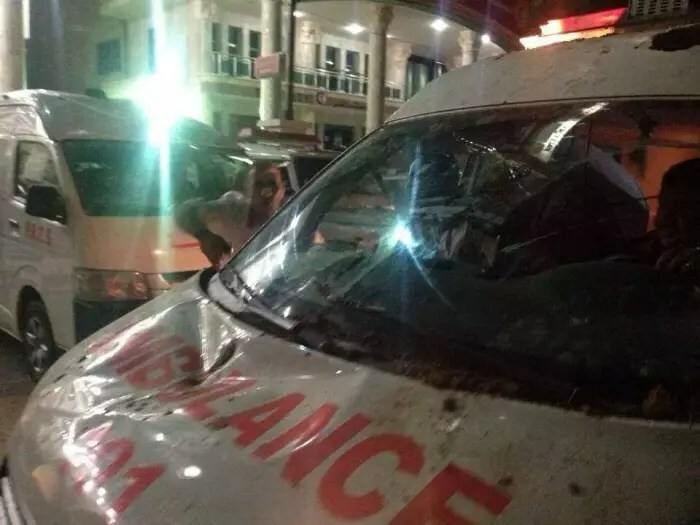 Pictures have emerged that appear to show an injured ambulance worker and damaged Red Crescent ambulances after Israeli air strikes hit land behind the ambulance station in Jabalia, northern Gaza this evening 09/07/2014). 3 injuries have been reported. 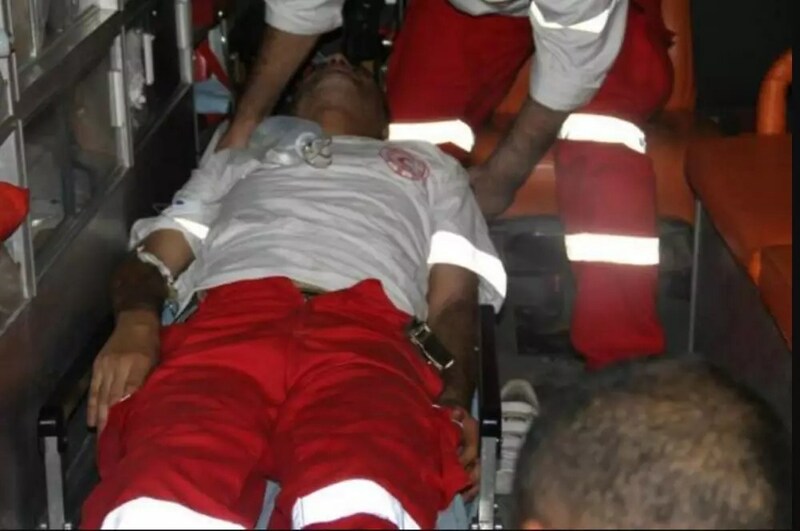 Wednesday evening, April 17, 2013, Israeli soldiers opened fire at a Palestinian Red Crescent Ambulance while trying to provide medical care to family members, including an infant, injured by gas bombs fired by the army at their home, in Al-Khader town, south of Bethlehem. 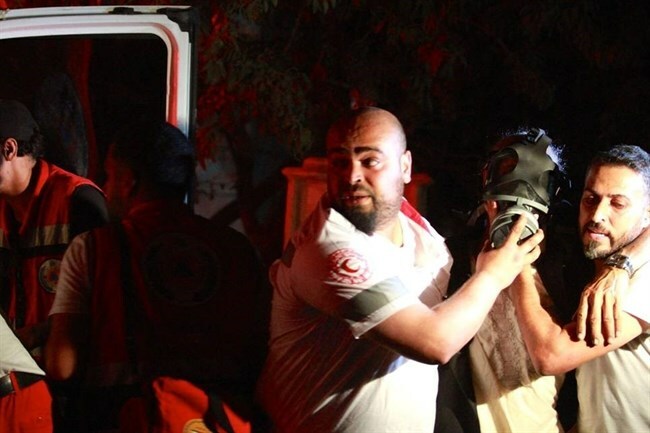 Abdul-Halim Jaafra, head of the Emergency Unit at the Bethlehem Branch of the Red Crescent, told the Radio Bethlehem 2000 that five Palestinian family members, including an infant, suffocated after inhaling gas fired by the army at their home. He added that as the medics rushed to rescue the family, the army fired rubber-coated metal bullets at the ambulance shattering its front shield; no injuries were reported among the medics. The incident took place during clashes that took place in Al-Khader between local youths and invading Israeli soldiers. OCCUPIED JERUSALEM, (PIC)– The Ahrar center for prisoners’ studies and human rights has denounced the Israeli occupation forces (IOF) for arresting Dr. Amani Ode from Bustan suburb in occupied Jerusalem at dawn Wednesday. Amjad Abu Asab, in charge of Jerusalemite prisoners, said IOF soldiers stormed the suburb before dawn and broke into the home of Dr. Amani and wreaked havoc on it before taking her away. He said that young men threw stones at the soldiers who fired rubber-coated bullets indiscriminately. He added that the wife of detainee Mohammed Ode, Amani’s brother, was hit with a bullet in the face and was hospitalized. Fuad Al-Khafsh, the center’s director, charged the Israeli occupation authorities (IOA) with intensifying attacks on occupied Jerusalem especially after its inhabitants organized solidarity campaigns with the detained hunger strikers. Dr. Amani Ode is the daughter of liberated prisoner Mousa Ode, who is now a member of the Bustan committee that was formed after the IOA decided to raze dozens of houses in the suburb. HEBRON (Ma’an) — Israeli forces blocked the entrance to southern West Bank town Beit Ummar on Thursday morning, preventing an ambulance from leaving, a local activist said. 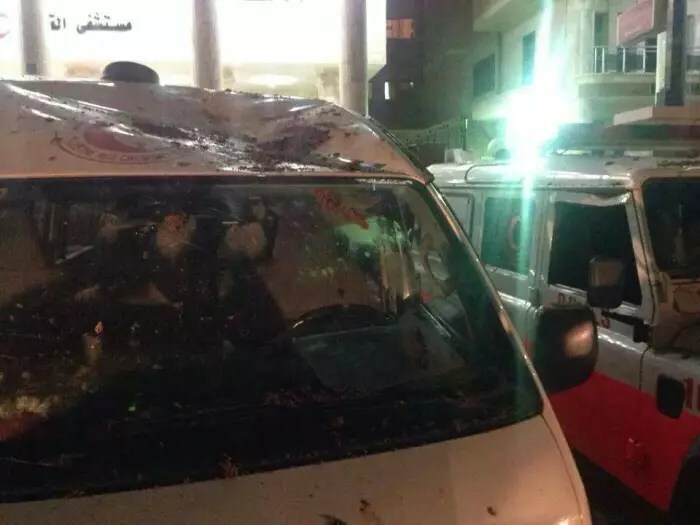 The ambulance officer informed the soldiers that the Red Crescent vehicle was taking a woman in labor and another patient to hospital in Hebron, popular committee spokesman Muhammad Ayad Awad said. The Red Cross and the Palestinian military liaison called Israeli officials to press for the ambulance’s passage. An Israeli military spokeswoman said the entrance was temporarily closed due to heavy snowfall, but while soldiers were clearing snow, Palestinians hurled rocks at them. GAZA, (PIC)– Gaza Prime Minister Ismail Haneyya condemned targeting civilians, ambulance and media crews and hospitals by the Israeli occupation forces in the recent aggression, considering it a serious violation of all morals and international norms. He said that the missiles, which targeted the hospital, were carrying a message to Jordan mainly to convince Jordanian solidarity activists to leave the Palestinian territories. Parts of the Jordanian hospital have been destroyed, especially the administrative offices of doctors and nurses. The Palestinian premier hailed the efforts made by the medical crews in the Jordanian field hospital located in Gaza since the Furqan war, four years ago, and their determination to continue to support the people of Gaza even after bombing the hospital. He hailed the great cooperation between the Jordanian hospital and the Palestinian ministry of health, noting that the hospital has been working round the clock in the recent aggression, even after being bombed by the IOF. 10. Zakariya Said Helles, 21; who is a nurse at Mohammed al-Durrah Hospital and who sustained wounds in the nose as he was hit by glass shrapnel from the crushing windows. There are not currently volunteers maintaining this page regularly; but there may be occasional posts. Scroll down to the Useful Links below for uptodate information, and LIKE the DTR facebook page below as it may be slightly more active!